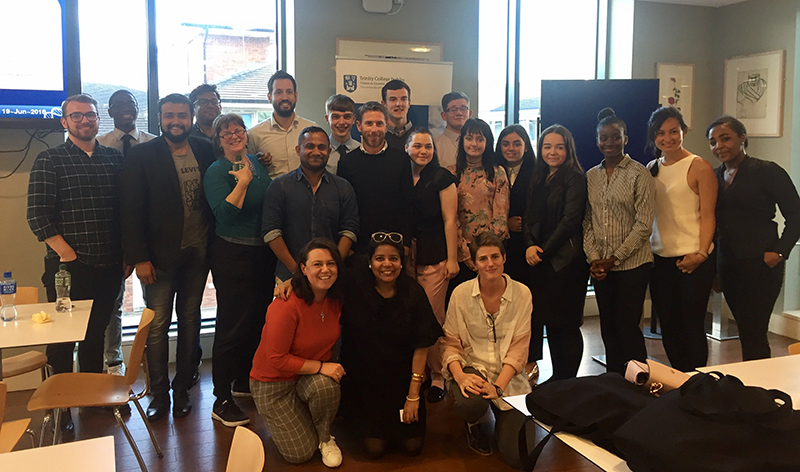 Members of the Full Time Trinity MBA Class of 2018 met 10 fifth year students from the Trinity Access Programme (TAP) on June 19th, who were attending a summer school residency on campus. The students were participants in JP Morgan's Advancing Young Professionals Residential Programme. The idea for the networking event arose from discussions between MBA students around women in business. Amelia Scivier and Janel Gomez led the initiative and Amelia had this to say about the event, 'We collectively wanted to give back in a way that would help break down perceived social boundaries surrounding business schools, particularly around MBAs. Meeting people and putting faces and names to titles is helpful as tools like LinkedIn can be intimidating. We wanted to organise something that was relaxed and welcoming so our classmates could tell their stories. Life isn't black and white, careers aren't black and white and the path to where you want to go is often full of curves. We wanted the students to know that MBAs aren't as inaccessible as they may seem because we all come from such a wide array of backgrounds and industries and experiences'. The students from TAP who attended the MBA networking session reflected that it was great to have the opportunity to network ahead of another networking event at JP Morgan the following week and that they felt more comfortable and confident as a result of their experience with the MBA students. Sincere thanks to Amelia and Janel, Emilie and David from TAP and all those who took the time to attend. We hope this will become a regular fixture in the TAP/MBA calendar.